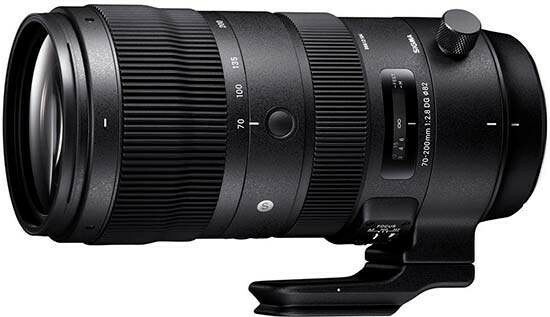 Sigma today announced the pricing and availability of the highly anticipated flagship Sigma 70-200mm F2.8 DG OS HSM Sports telephoto zoom lens. Ronkonkoma, NY – December 10, 2018 – Sigma Corporation of America, a leading still photo and cinema lens, camera, flash and accessory manufacturer, today announced the pricing and availability of the highly anticipated Sports line addition announced at Photokina – the new flagship large-aperture telephoto zoom Sigma 70-200mm F2.8 DG OS HSM Sports. The new lens to complete the Sigma F2.8 zoom trio, including the award-winning 14-24mm F2.8 DG HSM Art wide-angle zoom and the 24-70mm F2.8 DG OS HSM Art modern workhorse zoom – the essential tools for professional photographers, will begin shipping in Canon mount in late December for $1499.00. The advanced optical formula delivers the renowned Sigma Art image quality inside the rugged, weatherproof build of a Sports lens. With the strongest possible optical formula, sturdy yet lightweight design and exceptional handling, the Sigma 70-200mm F2.8 Sports lens is a staple for professional photographers and advanced amateurs looking to expand their artistic expression in an action setting. The lens incorporates Intelligent OS with an acceleration sensor and the latest algorithm capable of panning in all directions. This algorithm, alongside high-speed AF and HSM, allows photographers to capture instantaneous photography movement, an absolute necessity for the best sports and action lenses. The Sigma 70-200 F2.8 Sports’ optical design delivers excellent correction of color aberration through its 9 FLD (“F” Low Dispersion) glass elements and 1 SLD (Special Low Dispersion) glass elements. This ensures high resolution from the center to the edges of the image, making it suitable for all photography genres, from news to sports to wildlife. It’s even great for portrait photography, with a smooth bokeh effect achieved through 11 rounded diaphragm blades and optimizing spherical aberration. Like all other lenses from the Sigma Sports line, the Sigma 70-200mm F2.8 is handcrafted with a dust- and splash-proof structure featuring a water- and oil-repelling coating on the front element. Photographers can take on the most difficult shooting conditions without having to worry about lens safety – instead, they can rest assured they will capture sharp images even in the most challenging situations. Despite its robust structure, this lens stands out with its light weight and high mobility thanks to the magnesium alloy components incorporated into its build. The new state-of-the-art facility located at the Sigma Aizu factory in Fukushima, Japan is now fully operational and solely dedicated to the processing of magnesium alloy. It provides toughness and durability while being lightweight, and minimizes the weight typically associated with a telephoto zoom lens. Equipped with customization options such as a Focus Limiter and Manual Override, the Sigma 70-200mm F2.8 lens is extremely versatile. An AF Function button is present to allocate various functions. By selecting it from the menu on the camera body, or using the optional Sigma USB Dock, users can locate and manipulate functions other than AF Lock to expand and accommodate their shooting styles. In addition, the tripod socket with 90° click stops, also made with a tough yet lightweight magnesium, is incorporated to ensure easier changes of shooting position from vertical to horizontal and vice versa. It can be attached directly to an Arca Swiss type clamp. The 70-200mm F2.8 DG OS HSM Sports, alongside the Sigma 14-24mm F2.8 DG HSM Art and the Sigma 24-70mm F2.8 DG OS HSM Art, completes the lineup of three F2.8 large-aperture zoom lenses capable of covering focal lengths from 14mm to 200mm. The three F2.8 zooms consisting of wide, standard and telephoto, are also known as “The Big Three Zooms,” offer wide coverage of the focal range, F2.8 brightness throughout the zoom range and extreme durability. Together, the lenses produce maximum performance in various scenarios, including scouting filming locations or overseas reporting assignments.